Financially, western countries around the world are in a pickle. I’m no accountant, but I certainly know that a balanced budget has neither a surplus nor deficit. Income must be equal with expense. All this chatter about “default,” and scaring people into thinking that only cutting expenses will balance the budget is just that—fear-based chatter. And it adds, metaphorically speaking, more brine to an already very sour situation. Because the language used is used to generate fear. Get folks scared enough and they’ll accept anything to ease their current discomfort. If there’s one thing this blog is going to hammer away at, it’s about fear-based language. And anyway, isn’t default a matter of trading an uncomfortable situation for a worse one? When we were growing up there were times when we put cardboard in our shoes to cover the holes to keep out the water and dirt. We didn’t live in the country; we were city kids. But sidewalks can certainly eat away some shoes. This had the obvious result of creating fear that was passed along from the parents to the children. To this day, an unbalanced budget will send any one of us siblings into a really briny attitude. But imagine if our parents had decided to default on their debts. We’d have had a lot more to worry about than worn out shoes, I can tell you. They were reasonable people. They not only paid their debts, but found ways to increase revenues while lowering expenses. It was hard work. There are no shortcuts. Increase revenue. Reduce expenses (wink, wink and a hint to the House: you cannot balance a budget by cutting expenses only, you have to bring money in as well). I’ve been working with nonprofits for a long, long time. When an organization puts in a grant application, it must include a budget. Generally speaking, the budget had better be balanced to show that the agency is able to execute its mission while being fiscally responsible. In other words, they have to show that they bring money in as well as spend it. Agencies that try to reduce expenses by eliminating jobs and benefits for employees are trading one discomfort for another and often don’t look that great to the people doling out the cash. To balance a budget requires more than cuts (wink, wink and a hint to the House). 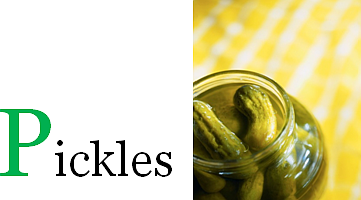 This year I’ve decided to give up pickles, both the briny kind and those manufactured situations that make life unbearable. It’s because giving up both will make my life sweeter and more enjoyable. It’s something I must do (wink, wink and a hint to the House). Stop the fear-mongering. Increase revenue. I know. It’s awkward.